The BondMaster® 600 delivers a powerful combination of multiple mode bond testing software and highly advanced digital electronics, providing consistently crisp and high-quality signals. Whether you are inspecting honeycomb composite, metal-to-metal bonds, or laminate composite, the BondMaster 600 offers exceptional ease-of-use thanks to its direct-access keys and streamlined interface that features convenient presets for common applications. The enhanced user interface and simplified workflow of the BondMaster 600 offers archiving and reporting that are accessible to any level of user. The resolution and brightness of the 5.7-inch VGA screen on the BondMaster 600 handheld bond tester becomes even more apparent when switched into full-screen mode. Activated by the simple touch of a key, the full-screen mode is always accessible regardless of the display mode or inspection method you are using. The BondMaster 600 bond tester is programmed for a range of standard inspection methods, including pitch-catch RF, pitch-catch impulse, pitch-catch swept, resonance, as well as a notably improved mechanical impedance analysis (MIA) method. The ergonomic design of the BondMaster 600 is convenient for difficult-to-access inspection locations. For inspection in tight spaces, the factory-installed hand strap provides maximum comfort while maintaining access to the most critical functions. The BondMaster 600’s case, based on a rugged, field-proven design, is world-renowned for withstanding the harshest, most demanding inspection conditions. The BondMaster 600 with its long battery life, airtight and water-resistant enclosure, high-friction bumpers, and dual-duty support stand/hook is a valuable tool for challenging inspection jobs. Long battery life (up to 9 hours). Compatible with existing BondMaster probes (PowerLink) and probes from other manufacturers. Bright, 5.7-inch color VGA display. Intuitive interface with application-specific presets. Instant display mode toggle using the RUN key. New SPECTRUM view and Frequency Tracking feature. The BondMaster 600 is offered in two models to accommodate the varying needs of composite bond testing. The basic model includes all pitch-catch capabilities, while the B600M model features all bond testing inspection methods. The upgrade from basic to multimode can also be performed remotely. Both BondMaster 600 models are compatible with existing Olympus BondMaster probes, including those equipped with the PowerLink technology. Optional adaptor cables are available to enable compatibility with probes from other manufacturers. One of the major assets of the BondMaster® 600 is its unprecedented ease of use. Its streamlined and user-friendly interface was developed by incorporating innovative features from other Olympus products and combining them with several new functions, including the Application Selection (presets) menu, the All Settings direct modification screen, and the ability to calibrate signals while in Freeze mode. All the advantages offered by the BondMaster 600 interface are available in 15 languages. Application selection menu provides instant, ready setup to the user. All settings screen shows all parameters for rapid editing. The BondMaster 600 features a comprehensive set of direct-access keys, allowing instant adjustment of commonly used parameters, such as gain, full-screen mode, display mode (RUN), and more. Signals are displayed in eight vivid and identifiable color schemes, and the screen’s enhanced visibility in indoor and outdoor conditions helps reduce operator eye fatigue. The BondMaster® 600 offers a completely streamlined and straightforward process for tracking your inspection results. Built-in features such as a large storage capacity (up to 500 data and program files) and an on-board file preview have been created to facilitate the inspection process, from start to finish. A typical workflow consists of a few simple steps: save your results during the inspection process, download the saved files to the new BondMaster PC viewing software, instantly generate a full inspection report using the new “Export all files as PDF” function, and archive the report if required. Press the SAVE key anytime during the inspection to record signals as viewed. Quickly download results to BondMaster PC through USB connection. Produce a complete report with the touch of a single key, and archive results as needed. During bond testing inspections, the pitch-catch probe produces flexural plate waves and compression waves, and compares changes in the signal amplitude between the probe’s transmitter and receiver as it passes over the inspected part, detecting disbonds on both the near and far side. The BondMaster® 600 offers three Pitch-Catch mode options: RF (fixed frequency waveform), Impulse (legacy view featuring an envelope filter), or Swept (sweeping through a selected frequency range). The Pitch-Catch menus of the BondMaster 600 have been optimized to provide fast access to the parameters that are adjusted most frequently during calibration and inspection. The real-time readings provide instantaneous information on the signal amplitude or phase, enabling you to interpret flaws more easily. The new Auto Gate mode automatically detects the best “gate” position based on the RF or impulse signal, reducing operator error and maximizing the results. Pitch-catch in impulse display split screen. The X-Y view (right) shows a record of both near and far side disbonds (phase difference). The BondMaster 600 Pitch-Catch Swept mode not only features improved signal quality, but also has a new “Spectrum” representation. This new view displays the live amplitude and phase of the signal compared to the frequency range. 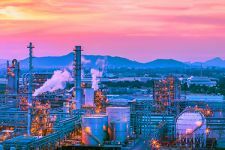 Two new frequency markers (called frequency tracking) allow you to observe the behavior of two specific frequencies so that you can choose the best detection parameters for a specific application. This new tool is ideal for developing procedures or new applications. Spectrum view with frequency tracking. Resonance mode measures the changes in phase and amplitude of the propagating/standing wave within the probe. Resonance probes are narrow bandwidth contact transducers, and the changes in probe crystal impedance is represented in the X-Y display of the BondMaster® 600. Resonance mode is a very simple and reliable way to detect delamination. Often, the depth of delamination can be estimated from signal phase rotation. Resonance mode on the BondMaster 600 is remarkably easy to operate, due in large part to its factory presets for laminate composite and metal-to-metal disbond applications. Resonance mode configured as “go-no-go”. Calibration of Resonance mode on the BondMaster 600 has been simplified to a minimum number of steps. First the optimum operating frequency for the probe is selected through the single-step calibration menu, and then the streamlined interface of the BondMaster 600 and the ability to calibrate from frozen signals make the final calibration quick and simple. Once calibrated, the improved signal reference and reference dot system of the BondMaster 600 enables you to easily track critical signals on the display during inspection. Moreover, its reference points system is so flexible that you can fine-tune the calibration without having to rerecord the points. Calibration menu automatically selects the best working frequency. Improved reference dot system of the BondMaster 600. 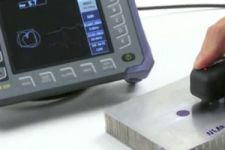 The bond testing mechanical impedance analysis (MIA) method measures the mechanical impedance, or stiffness, of a material. MIA probes emit a fixed, audible frequency. Changes in material stiffness are indicated as signal amplitude and phase changes in X-Y view of the BondMaster® 600. The small probe tip used with MIA, coupled with the high-performance electronics of the BondMaster 600, make detecting very small disbonds in honeycomb composite much easier than with other methods. Moreover, the extended MIA frequency range of the BondMaster 600 (2 kHz to 50 kHz) obtains maximum results, even for far side disbonds. The BondMaster 600 features a simple MIA calibration wizard that guides you in selecting the best possible frequency for detecting smaller and otherwise hard-to-find defects in honeycomb composite. MIA mode with new “Scan” view and real-time readings. The BondMaster 600 also displays real-time readings showing signal amplitude or phase, and its new “Scan” view allows you to monitor the probe amplitude and phase over time, aiding in the detection of small disbonds. Identifying repaired areas on aircraft rudders or fuselage can be a challenge, especially when they are painted. With certain inspection methods, such as thermography, repairs can generate false indications. However, MIA mode can resolve this problem. Because the repaired area is generally stiffer, its mechanical impedance contrasts well with good areas as well as with disbonds. The improved MIA method offered by the BondMaster 600 allows you to identify repaired areas with ease, through a simple phase analysis of the MIA signal in the X-Y view. MIA mode configured to identify repaired area (bottom signal) as opposed to disbonded condition (top signal). For a complete specifications list, please download the full BondMaster® 600 user’s manual. One USB 2.0 peripheral port, one standard VGA analog output port, one 15-pin I/O port (male) with analog output, 3 alarm outputs. Single lithium-ion rechargeable battery or AA size alkaline batteries (in an 8-cell holder). Full VGA (640 × 480 pixels) color, transflective LCD (liquid crystal display). Normal or Full screen, 8 color schemes. RUN key to toggle between screen modes. BondMaster PC software, included in base BondMaster 600 kit. BondMaster PC allows viewing saved files and printing reports. 500 files featuring user-selectable on-board preview. English, Spanish, French, German, Italian, Japanese, Chinese, Russian, Portuguese, Polish, Dutch, Czech, Hungarian, Swedish, and Norwegian. Application Selection menu for easy and rapid configuration in all modes. Pitch-Catch, Mechanical Impedance Analysis (MIA-B600M only) and Resonance probes (B600M only). The instrument is fully compatible with BondMaster PowerLink and non-PowerLink probes, as well as those of other main probe and accessory suppliers. 3 simultaneous alarms. Choices include BOX (rectangle), POLAR (circle), SECTOR (pie), SCAN (time-based), and SPECTRUM (frequency response). 10 μs to 7920 μs, adjustable in 10 μs steps. New Auto Gate mode automatically detects maximum amplitude. Up to 2 user-adjustable markers to monitor 2 specific frequencies from the Swept figure. If you work in explosive atmospheres, the BondMaster 600 Ex bond tester conforms to the requirements of the ATEX directive. For more information, read our FAQ on the ATEX directive. Model: Basic and Multi-mode (M) . Power cord: Over 11 power cord models available (for the DC charger). Keypad and instruction label: English, international (icons), Chinese, or Japanese. “Getting Started” print manual: over 9 languages available. Items included in all BondMaster 600 models†: BondMaster 600 instrument with factory-installed hand strap, getting started manual, calibration certificate, rigid transport case, DC charger with power cord, Li-ion battery, AA battery tray, USB communication cable, MicroSD memory card and adaptor, Pitch-catch and MIA probe cable, and BondMaster PC software and product manuals disc. †Standard inclusions may vary depending on your location. Contact your local distributor. Additional items included in BondMaster 600M model only: Resonance probe cable. Pitch-Catch probes are ideal to detect skin-to-core disbond in composite honeycomb. The broadband probe crystals allow scanning over a wide range of composite thicknesses. Mechanical Impedance Analysis probes are best to detect smaller skin-to-core disbond on composite honeycomb. They are also a great tool to identify repaired (potted) areas. Resonance method is ideal to detect delamination in composite laminates or inspect metal-to-metal bonding. Resonance probes come in various frequencies to accommodate the wide range of composite thicknesses and ply structure found in the industry. BondMaster probe kits feature common kits approved in various procedures and work instructions.